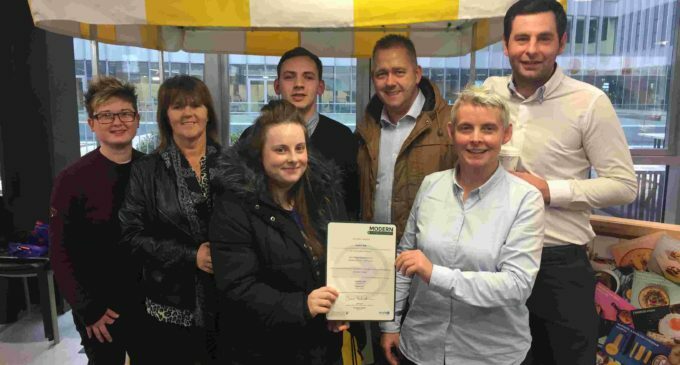 A young student from Glasgow has become BaxterStorey’s first qualified apprentice in Scotland. Eighteen-year-old Laura Bell has been offered a full-time role within the firm and now works in a commis chef role at the company’s Arnold Clark contract in her home city. After joining the apprenticeship scheme last year and creating its programme in partnership with Go@l Training, CIS Excellence Chef of the Year sponsor BaxterStorey Scotland placed Laura (pictured above centre) at Scottish Water near Glasgow, where she worked under the mentorship of chef manager, Ken Moodie. A government initiative aimed at tackling Scotland’s skills gap, Modern Apprenticeships help employers to train staff and develop the skills of existing employees.